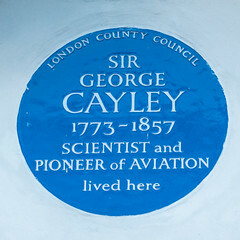 Sir George Cayley, 6th Baronet (27 December 1773 – 15 December 1857) was a prolific English engineer and is one of the most important people in the history of aeronautics. Many consider him to be the first true scientific aerial investigator and the first person to understand the underlying principles and forces of flight. In 1799 he set forth the concept of the modern aeroplane as a fixed-wing flying machine with separate systems for lift, propulsion, and control.He was a pioneer of aeronautical engineering and is sometimes referred to as "the father of aviation." He discovered and identified the four forces which act on a heavier-than-air flying vehicle: weight, lift, drag and thrust. Modern aeroplane design is based on those discoveries and on the importance of cambered wings, also identified by Cayley. He constructed the first flying model aeroplane and also diagrammed the elements of vertical flight.He designed the first glider reliably reported to carry a human aloft. He correctly predicted that sustained flight would not occur until a lightweight engine was developed to provide adequate thrust and lift. The Wright brothers acknowledged his importance to the development of aviation. 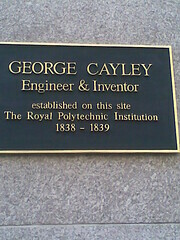 Cayley represented the Whig party as Member of Parliament for Scarborough from 1832 to 1835, and in 1838 helped found the UK's first Polytechnic Institute, the Royal Polytechnic Institution (now University of Westminster) and served as its chairman for many years. He was a founding member of the British Association for the Advancement of Science and was a distant cousin of the mathematician Arthur Cayley.